Bromyard Road Methodist Church, Worcester WR2 5DL on Thursday at 14.00hrs. 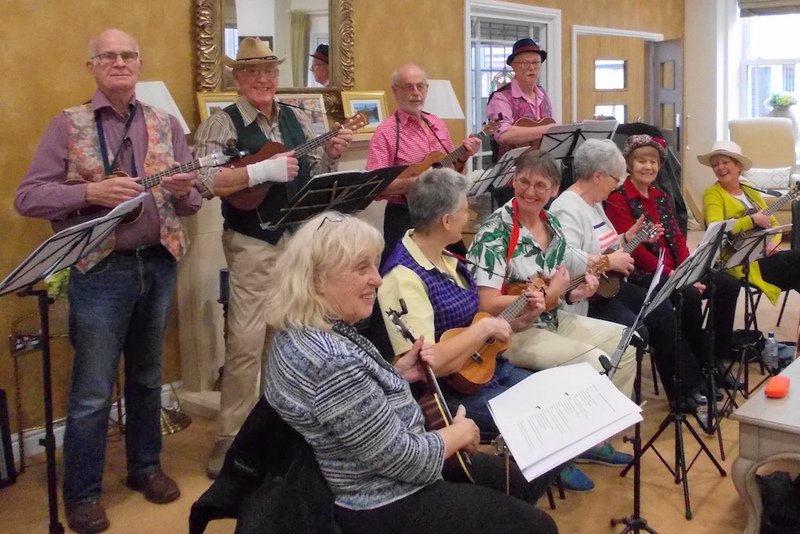 We are a large, friendly and supportive group who meet on alternate Thursdays at 14.00 in Bromyard Road Methodist Church to learn and play the ukulele and sing. Our sessions last up to two hours but we usually play for about 90 minutes allowing time for instruction and discussion and a short break. We play and sing a variety of songs from a variety of traditions including 50s, 60s and 70s pop, folk, traditional, gospel and pre-war. 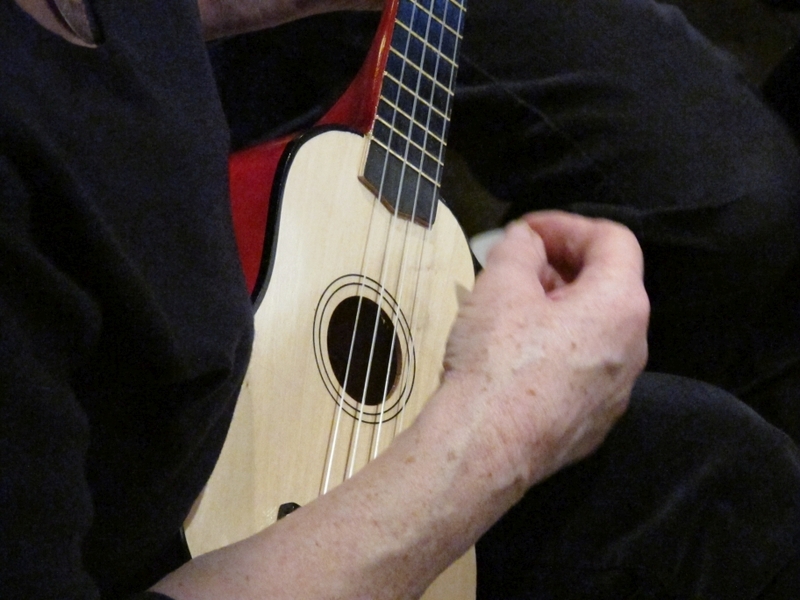 Following feedback from group members the emphasis of our group meetings during 2018/19 will be on learning and practice, rather than just playing, with more opportunities for learning different strumming patterns and techniques like finger picking. All levels of playing and singing are welcome and we will make sure beginners spend some time with one or more of the experienced players while they pick up the basic skills. However the ukulele is an easy instrument to learn and most beginners will be able to play a number of simple songs after two or three meetings. We use song sheets with the words and chords shown, so you do not have to be able to read music. We post our songs on a dedicated web site, the address of which will be given to you when you join the group. All members are expected to access these songs and print their own copies for use in sessions so it is important that you have access to a computer and printer, email and the internet. Alternatively some members save the songs to a tablet or other device which saves on paper and printing costs. If you do not already own a ukulele, let us know when you join the group and we will try to arrange for you to borrow an instrument for the first couple of meetings. Once you feel confident you want to carry on learning, you will need to buy your own ukulele and we can give advice on what to buy and where, and the likely cost. You will also need to buy a music stand but you may be able to share one for the first few meetings. 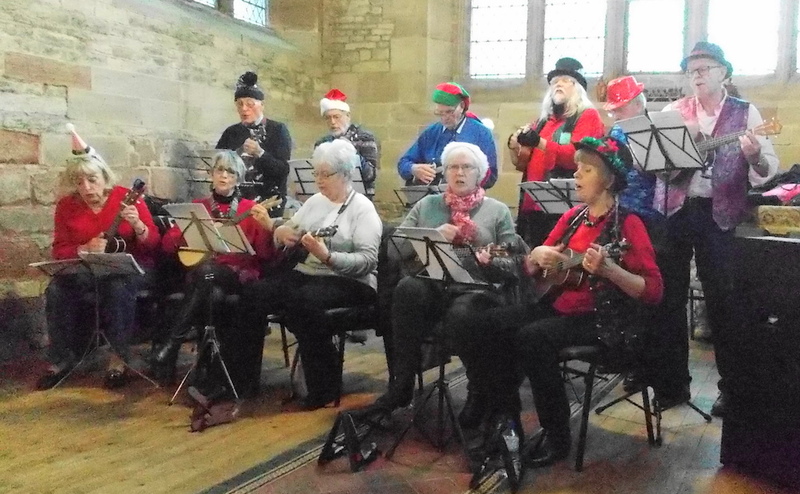 In addition to our fortnightly meetings some of us occasionally perform in public as The U3A Ukestars. We do this for free as a way of developing our skills and to help promote Worcester U3A. Performing in public is not compulsory for group members but it is great fun and a wonderful boost to your confidence. “THANK YOU so much, you were all fab. I really enjoyed your playing and the songs were a great choice! “ Kempsey Christmas Market, November 2017. “I am wondering if you are available to come to Francis Court again and play for us, everyone had such a lovely time when you came before”, Francis Court, November 2017.